Chinese Eight ball or the backward eight ball play is a hybrid of the normal 8-ball game. It reverses the play of eight-ball by shooting object balls at the cue ball instead of vice versa. It is also combined with the shooting style of carom billiards game. The play came from an imaginative idea that things can be done backward, and so is a pool game. The rules are the same with the regular eight ball game. Each player or team need to pocket their corresponding balls (solids or stripes). After doing so, the "money ball" ﻿is pocketed last. Which in this game is the 8-ball. Gareth Potts is a professional pool player and a World Chinese Eight Ball Master. This photo shows Potts at the Joy Billiards World Chinese 8-Ball Masters 2017. Like a normal eight ball game, two players or two teams vie for the win in Chinese Eight Ball. The Similar set of 16 balls in eight-ball is used for the Chinese Eight Ball. This includes 15 regular object balls and a cue ball. Setting up the rack takes on as a normal eight ball game would. The 8-ball should be at the center of the rack. All other balls may be placed at random inside the triangle rack. For as long as one striped and one solid ball is at each end corner. 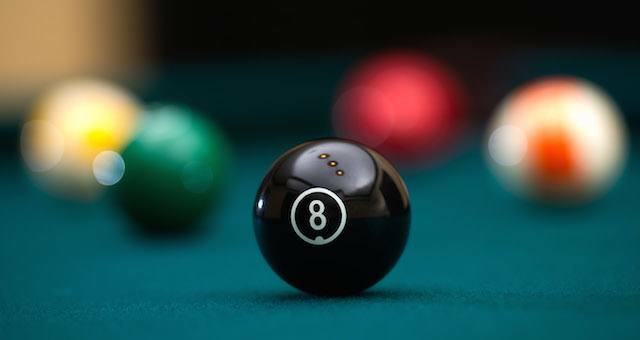 Chinese Eight Ball Billiards is known as reversed 8-ball pool although balls are set up the same way. The Opening breaks start with the first player shooting the rack with the cue ball. The break is only considered legal if a ball is pocketed, or, two balls hit the cushions. A legal shot enables the breaking player to strike again. It is only during the opening break that players can legally shoot the cue ball using the cue stick. Seen in this photo is the proper way to rack balls for Chinese 8-Ball. The 1-Ball should be at the apex touching the foot stop. While the 8-Ball is at the middle of the rack, just above the 1-Ball. After the opening break, the game proceeds with players pocketing an object ball using their cue sticks. Players must call the shot prior to making it to deem it valid. The object ball must then carom off to the cue ball then into the identified pocket. Note that although an object ball was pocketed successfully, the pool table remains “open”, for neither player has all “stripes” nor “solids” ball claim. A player must securely pocket an object ball through a legal shot to determine which object balls are his/hers to sink for that game. A legal shot is accomplished by striking the object ball also known as a ‘shot ball’ into the cue ball before touching any other ball. 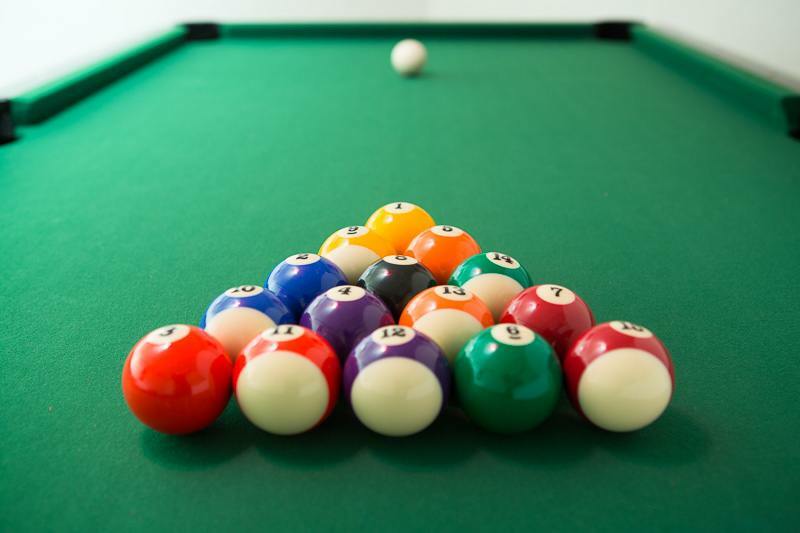 Like most pool games, object balls may unintentionally hit other balls or cushions before falling into a pocket. Shots as such would only count if it lands inside the same p﻿﻿﻿﻿ocket called by the s﻿﻿﻿﻿hooting player. Once all object balls are all successfully pocketed, the final shot is made on the 8-ball. When an object ball touches the cue ball during at the start, a player must strike away from the cue and hit it by banking off the cushion. A foul will be called when the cue ball moves before the object ball comes in contact with the cushion. It is also considered a foul or a scratch when the cue ball lands inside a pocket or jumps off the pool table. The cue ball is situated at the head spot, or as close as possible to the line perpendicular to the head cushion. In the case of any of the above fouls, one of the player’s pocketed ball is pulled out from the pocket and placed on the footer spot. Or as close as possible to the said spot if the foot cushion if occupied. A missed or illegal shot doesn’t necessarily result in a pulled ball except for when a ball sinks during that particular illegal shot. All illegally pocketed balls of opponents, or those pocketed through foul remains in the pocket. On the other hand, a player’s own balls, which are pocketed due to a foul or illegal shot is pulled out and placed on the footer spot. A player’s turn ends when he or she commits an illegal shot. An example would be the failure to hit the white cue ball first before pocketing an object ball. The competing side gets the chance to play the table as it is, with the balls at rest. Alternatively, if the center is unoccupied, the opponent may move the cue before making a shot.